Kansas wide receiver Jeremiah Booker makes an over the shoulder catch against TCU Saturday. Kansas has the better basketball program, Kansas State the superior football team. It’s been that way nearly every year for more than a quarter of a century. At the moment though, it’s a tough call in both sports. Kansas is No. 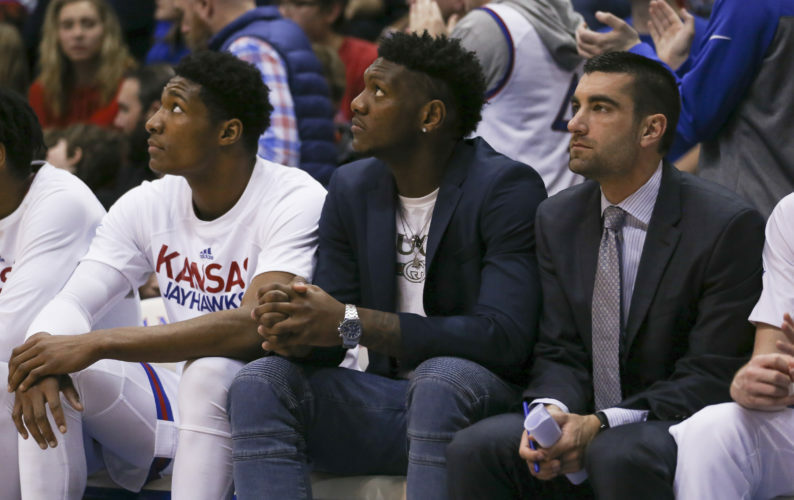 1 in the nation in basketball, but with so many new faces and such a young backcourt, it could be a while before the Jayhawks justify that forecast. Meanwhile, Kansas State, underrated nationally at No. 12, has every significant player back from its Elite Eight squad, including preseason Big 12 Player of the Year Dean Wade. The playing field evened in football in the state with what happened over the weekend. 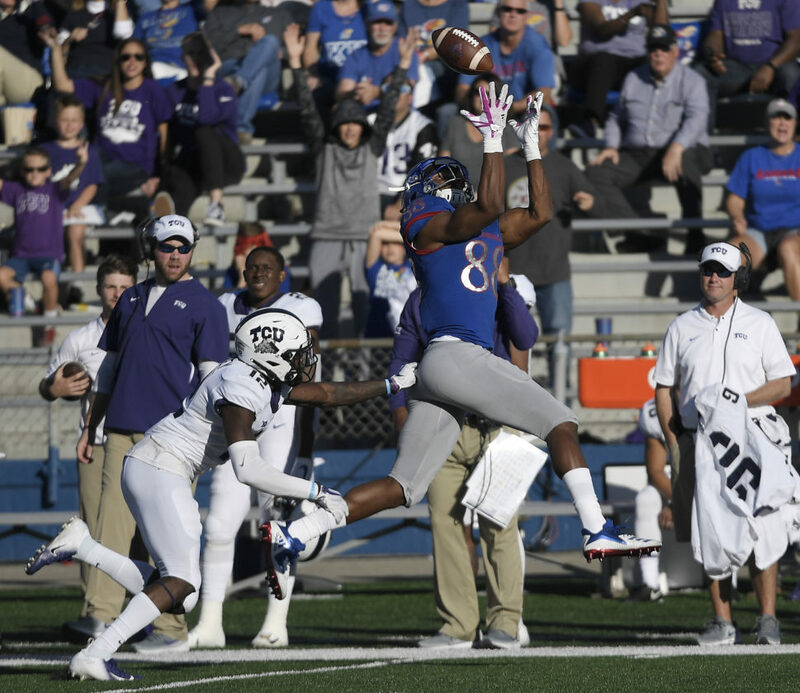 Kansas survived a crazy final seven seconds to prevail against TCU, 27-26, Saturday at David Booth Kansas Memorial Stadium. 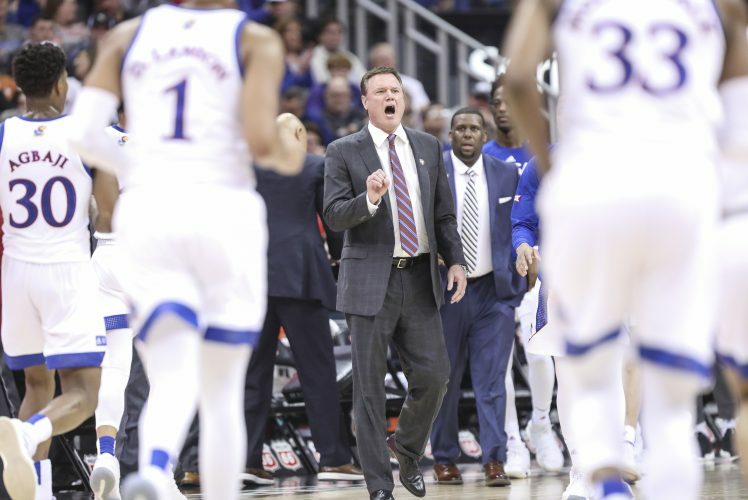 No longer alone in the basement, KU is tied with K-State and TCU for eighth in the Big 12 with a 1-4 record, and has the same overall record (3-5) as the Wildcats. In the aftermath of a 51-14 loss to Oklahoma, K-State coach Bill Snyder made remarks that left some wondering if the end of a remarkable coaching career is nearing. Strong words from a longtime supporter of the coach who three weeks ago celebrated his 79th birthday. Heading into the season, this shaped up as a weak year for the Big 12 and that was with a better projection for Kansas State. The conference pretty much has played out that way. 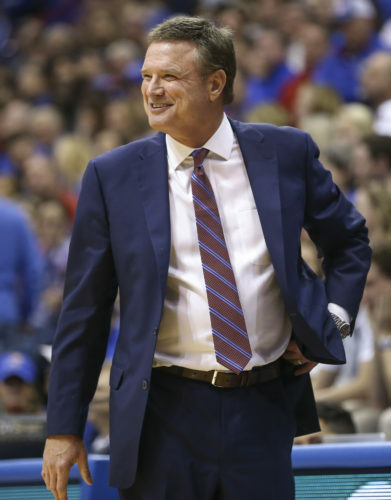 Suddenly, the first multiple-win season in Big 12 play for Kansas since 2008, also the same year KU defeated K-State, doesn’t feel so far-fetched. 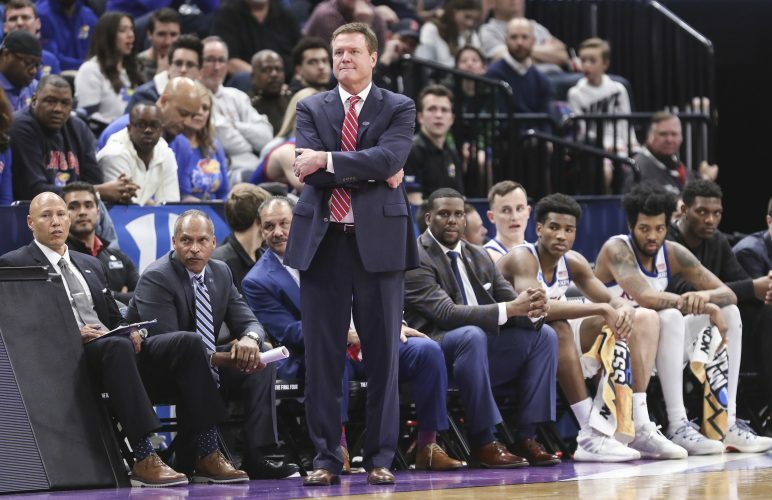 On a trip to Manhattan for a Nov. 10 game, KU will try to end K-State’s nine-game winning streak in the series. Two weeks out, picking a winner in that one is a whole lot tougher than in most seasons.